Most of us find companionship among our family and friends. When we need to reach out, we can call upon people next door, around the corner or across town to rely on. 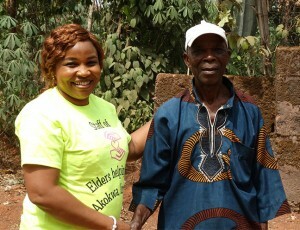 Many of the elders living in rural, small towns across Nigeria do not have a similar network. Many live in remote areas with no close neighbors. Due to a host of reasons, many elders live alone. The death of a spouse, children who have moved to far-off cities for employment opportunities or relatives who don’t have access to a car all contribute to the isolation of these elders. Because health problems occur more frequently in elderly populations, this can further restrict their travel and contact with others. These are people who worked their entire lives, raised families and gave their most productive years to ensure the success of the next generation. Our goal in the short term is to match elders in these remote areas with “Helping Hands” who will travel to the elder’s homes and provide cooking and light cleaning services. They may also assist the elders by performing errands like bringing food and other household necessities from the market or driving the elder to visit a friend or to a doctor’s appointment. And of course our Helping Hands will be companions to the elders, listening to their stories, concerns and wisdom. Our long-term goal is to build a community center where the elders can meet and engage in many of the activities they enjoy; play cards, listen to a musical performance, take an art class or stay healthy through an exercise group. Your donation not only provides elders with the companionship and assistance of our Helping Hands, but also offers employment opportunities to young, capable people who might otherwise move out of their community to seek opportunities elsewhere. Even a modest donation can make a difference and we invite you to look through our website to learn more about our mission.